The state government deployed NDRF and ODRAF personnel to speed up rescue and relief operations. BHUBANESWAR/BERHAMPUR: The toll in Cyclone Titli in Odisha rose to three Friday after two bodies were recovered in Ganjam district, near where it made its landfall, as the state government deployed NDRF and ODRAF personnel to speed up rescue and relief operations. One of the two bodies was that of a 40-year-old fisherman from Vizianagaram in Andhra Pradesh, said police, which found it. The fisherman was reportedly missing since Wednesday from Ramayapatna under Golanthara police station limits and his body was found near the jetty of Gopalpur port. His identity is being ascertained, said the inspector in-charge of marine police station, Arjeepalli Baideshi Behera. The other body found is that of a 45-year-old man of Bhuta Pankal village under Sorada block in Ganjam district who had been missing since the very severe cyclone struck the state Thursday, police said. The body was found 200 feet downstream of the village, inspector in-charge of Sorada police station Prabhat Sahoo said. Five persons from the village were missing since they crossed Khadangi nullha while returning to their homes from a cyclone shelter on Thursday. Search is on to locate the four others, he said. On Thursday, the body of an eight-year old boy, who had slipped into a canal at Saradhapur village under Hinjili police station, was found by locals, police said. In Andhra Pradesh, eight lives have been snuffed out by the twister on Thursday. The Odisha government is, however, yet to confirm the deaths. "We have seen media reports of the deaths of two or three persons in districts. We are verifying it," Chief Secretary A P Padhi said to questions by scribes on the human casualty due to Cyclone Titli. It deployed NDRF and ODRAF personnel Friday to speed up rescue and relief operation mainly in the southern districts of Ganjam, Gajapati and Rayagada where more than 60 lakh people were affected by flood due to heavy rainfall triggered by the cyclone. The flood situation in three districts is grim as the water levels in major rivers like Rushikulya and Bansadhara have crossed their danger marks, official sources said. The three districts received highest rainfall for three days under the impact of Cyclone Titli. Special Relief Commissioner (SRC) B P Sethi said people in Balasore district were also affected by the flood. The decision to step up relief and rescue operation was taken at a high-level meeting where Chief Minister Naveen Patnaik took stock of the situation. In a video conference with the district collectors of Ganjam, Gajapati and Rayagada, Patnaik gave instructions for intensifying rescue and relief operation on a war footing as people faced the twin calamities of cyclone and floods. Patnaik stressed on quick repair of breaches in several river embankments and directed district collectors to provide cooked food to the evacuated people, Sethi said. He constituted a three-member ministerial committee to visit the three worst-affected districts to monitor rescue and relief operation. Two helicopters were requisitioned from the Indian Navy mainly for rescue and air dropping of relief materials in villages in Ganjam district as the areas are cut off from rest of the state due to the submergence of roads with rain and flood waters, Padhi said. In Ganjam, 13 of its 22 blocks were badly hit in the cyclone and floods. Blocks like Aska, Purusottampur and Sanakhemundi were inundated by rainwater as well as water from Rusikulya river which gushed into the villages, a senior official said. The low-lying areas in Cuttack, Bhubaneswar and the pilgrim town of Puri were also waterlogged due to the rain. "A large number of pumps have been pressed into service by the Bhubaneswar Municipal Corporation and Cuttack Municipal Corporation to clear water," a civic body official said. Connectivity in Lathipada-Shergad road in Ganjam was disrupted while a bridge on Badagada Jarau river was washed away in the heavy rainfall, official sources said. Train services were affected by the cyclone and floods and at least 16 trains were cancelled and several others rescheduled by East Coast Railway (ECoR) on Friday due to submergence of railway tracks. Water level on railway tracks in Berhampur-Palasa section is yet to recede due to continuous rains, an ECoR official said. Director of Bhubaneswar meteorological centre, H R Biswas said heavy to very heavy rainfall will continue to pound parts of the state, including Balasore, Bhadrak and Dhenkanal districts, till Saturday. Around three lakh people were evacuated from the vulnerable areas of five coastal districts of the state Wednesday, a day before the cyclone made a landfall. 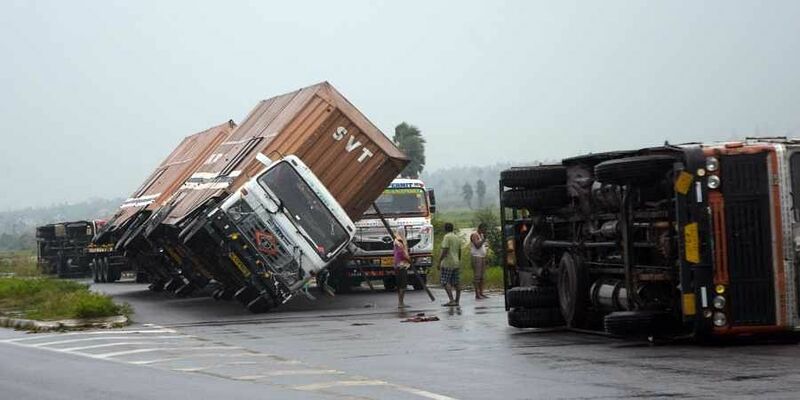 The severe cyclonic storm packing winds of up to 150 kmph and widespread rains had hit eastern India coast Thursday, killing eight people in Andhra Pradesh and one in Odisha.